If you’re asked to think of an iconic video game soundtrack, what is the first that comes to mind? Is it the cheerful chip-tune melodies of Super Mario Bros. or perhaps the sinister orchestral music of Dead Space? Perhaps the first thing that comes to mind is not a score, but rather a series of popular songs added to the game, like the Billboard Hot 100 floor-fillers of the Grand Theft Auto V soundtrack. Whichever it may be, chances are that heavy metal music rarely features. While the Guardian reports that video games account for billions of dollars in revenue for musicians and bands, these numbers haven’t yet been broken down by genre. One thing that is certain is that the biggest video game releases very rarely feature heavy metal soundtracks from the likes of Metallica or Iron Maiden. Nonetheless, heavy metal music still plays a significant role within certain genres of video game, and are often instrumental to the overall player experience. Let’s dive deep into the role that heavy metal music plays in the video game industry to see what the future holds for the greatest genre of all time. While heavy metal video game soundtracks are somewhat few and far between, there are a few titles that are synonymous with seriously epic guitar solos and screaming vocals. 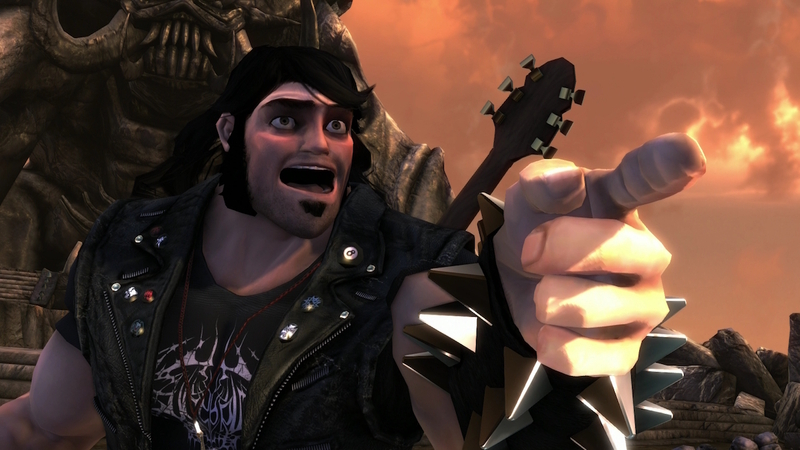 Just like with the music itself, heavy metal video games tend to be geared towards more specific audiences, with most releases being small, indie or, shall we say, quirky. A look at some of the major heavy metal games will throw up some common themes. There’s the excellently gory Brutal Legend series, which consists largely of making mincemeat out of a whole world’s worth of demonic enemies, using your trusty electric guitar as a battle-axe. This game is probably the single most metal game of all time, with the main character being voiced by none other than Jack Black himself, while other gods of heavy metal such as Ozzy Osbourne, Lemmy Kilmister, and Rob Halford of Judas Priest all make some pretty epic appearances. The hallmark of Brutal Legends is fast-paced, gore-stained combat gameplay. This same style pops-up again and again in games with a heavy metal OST. There’s the fittingly-named Namco slash-em-up Splatterhouse, which allows you to massacre demons to some of the sickest metal bands around, including Lamb of God and Five Finger Death Punch. Similarly, comically over-the-top combat games such as Bayonetta and Shadows of the Damned are all about the heavy metal tracks, combing a mixture of original scores and well-established hits from legendary artists. Even the original gory shoot-em-up, the 1993 release of Doom, is typical of all the later games which have featured heavy metal. It seems the genre has been typecast. It’s worth asking what it actually is about heavy metal music which adds to the gameplay experience, and what it is about the music specifically that works so well with the kinds of games listed above. The research into the emotional and physical effects that certain types of music have on gameplaying is well-documented. Research from the online casino giant Betway highlights that gamers of a different type of game, i.e. slot machines, are most responsive to music that is either fast and loud or taps into a sense of nostalgia. Both of these points apply to heavy metal. The use of the fast-paced and ear-piercingly loud metal tracks in violent combat games is clearly a natural choice, as it adds to the kind of macho and thrilling atmosphere the game is trying to invoke. The kinds of games that use heavy metal typically consist of a player having to fight off or completely obliterate huge waves of enemies in quick succession. A shredded guitar solo is therefore good for building up the momentum as you slice your way through hundreds of enemies, powering up and earning upgrades as you do so. In the same way that casinos do, video game developers have made effective use of heavy metal to essentially keep people playing. The nostalgia factor should also not be discounted here. Heavy metal enjoys a die-hard fanbase and any video game that features the fanbase’s favorite artists is guaranteed to sell big. That’s why the Guitar Hero franchise decided to vanquish their rival Rock Band once-and-for-all by releasing Guitar Hero: Metallica in 2009, featuring all of the greatest band in history’s best tracks, and several original recordings. The game went on to quickly sell 1.5 million copies, making it one of the series biggest successes. It seems that, while fans will always flock to a heavy metal video game, the music genre itself has plenty of potential beyond committed fanbases. Many of the games that prominently feature such soundtracks happen to be very successful, showing that the potential of metal to keep players glued to their controllers should give game developers of all stripes some serious pause for thought.